When faced with thinning hair or hair loss, many individuals turn to hair care treatments like shampoos to help them with their condition. Depending on the type of hair loss being experienced and the degree of that hair loss, this decision can be an effective and rewarding one. Can Shampoos Reverse Hair Loss? 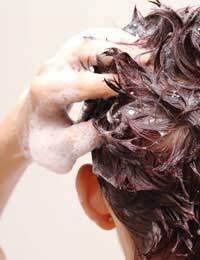 Depending on the type of shampoo you choose, and the active ingredient of that shampoo, the short answer can be yes. Certain hair loss shampoos contain botanicals that act to neutralise the effects of DHT in the hair follicle. DHT, an enzyme that is produced as a by-product of testosterone, is currently thought to be the leading cause of Hereditary Hair Loss, also called Male Pattern Baldness. Another active ingredient in effective hair loss inhibiting shampoos is thymus peptides. These also penetrate to work deep within the hair follicle but claim to stop hair loss through a process of deep cleaning and pore unclogging, so that new hair growth can break free and begin again naturally. These shampoos support their effectives with the theory that Hair Loss is caused by an autoimmune disease where the white blood cells attack foreign matter, such as dirt and debris, to eliminate it from the pores. This white blood cell concentration causes interrupted hair growth. However, the deep cleansing of the peptides will reduce the need for excess white blood cells and allow the follicle to function properly and produce hair. If you choose a shampoo that contains botanicals for DHT neutralisation, you can expect to see a reduction in hair loss within one week of starting treatment. With continued use you can expect to see new hair growth beginning in as little as four weeks. If you choose a hair growth enhancing shampoo that contains thymus peptides, you can expect to see a slowing of excess hair loss within 2 weeks and some new hair growth within three months. However, these types of shampoos are not effective for everyone who uses them. In clinical studies, thymus peptides have failed to produce new hair growth for 5% of females and 30% of males experiencing hair loss due to hereditary pattern baldness. If you are not looking to experience new hair growth, you have a few more options. Some shampoos, especially those that contain the active ingredient trichogen have been proven to thicken the hair shaft to provide the appearance of thicker hair and to stop or reduce hair loss. Other shampoos, with a wide variety of active ingredients, aim to thicken hair for more fullness, cover thinning hair spots with volume boosting capabilities, and or help nourish existing hair in order to keep it healthy and reduce breakage and early fall-out. Once you have decided which type of hair loss condition you want to treat and which active ingredient sounds the most promising for your condition, you need to look at the most popular shampoos available on the market. For individuals who wish to stop hair loss and stimulate new hair growth using a DHT neutraliser Nisim Cleansing Shampoo is a great choice. This company makes a wide variety of shampoos for hair loss, including once specially formulated for dry, oily, or combination hair. For individuals preferring to use thymus peptides for deep cleansing, ThymuSkin manufactures a variety of hair care products including shampoos. If you just need to give the thickness or volume of your hair a healthy boost, you can choose from the hundreds of specially formulated shampoos on the market at your local drug or grocery store. Many of these shampoos also boast products that can help make your hair shinier, softer, and more manageable. No matter what your needs, with a little research and time you are sure to find the shampoo that fits your hair loss condition, your hair type, and your lifestyle needs. For the best advice on looking after your hair type, read our articles Caring For Oily Hair and Caring For Brittle Hair.